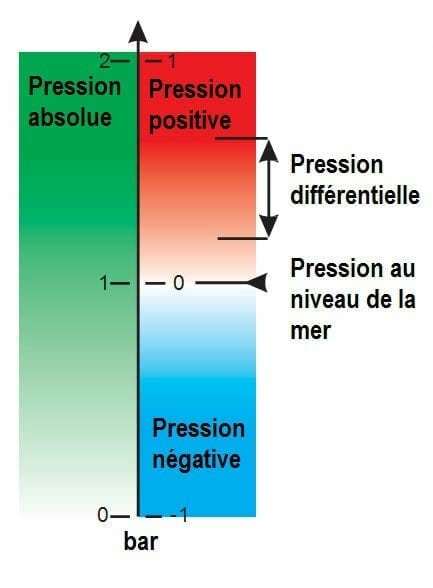 The negative-pressure is the pressure measured by regarding as zero the atmospheric pressure. It is expressed as the difference in pressure relative to atmospheric or barometric pressure and preceded by a minus sign. The zero point reference used in pressure is often implied by the context, and is added only when clarification is needed. For example: The tire pressure and blood pressure are relative pressures by convention, while atmospheric pressure, the pressure of deep vacuum and altimeter pressure are absolute pressures. The indication of moderate depression is often ambiguous, as with forgetfulness of the negative sign, it may represent an absolute pressure or abarometric pressure. The differential-pressure is the pressure difference between two points. Differential pressures are commonly used in industrial processes. Differential pressure switchesand differential pressure gauges have two inlet ports, each connected to one of the volumes whose pressure is to be monitored. This unit name is entered into force in 1971, andbefore that, pressure in SI was expressed in N/m². Sometimes the zero reference is shown in brackets after the unit, for example 101 kPa (abs). The pound per square inch (PSI) is still widely used in the United States and Canada, specially for cars. A suffix is often placed behind PSI to indicate the zeroreference measurement : PSIA for absolute, PSIG for barometric pressure, PSID for differential pressure. Because pressure was once commonly measured by its ability to displace a column of liquid in a graduated glass tube, pressures are often expressed as a length in mm or inches of a particular fluid such as mercury (Hg) or water. Atmospheric pressures are usually expressed in kPa (kilopascals), or atmospheres (atm), except in meteorology where the hectopascal (hPa) and millibar (mbar) are preferred. The normal atmosphere (atm) was defined in 1954 as being equal to 1,013,250 dynes per cm² (101 325 Pa). It corresponds to the pressure from a height of 760 mm of mercury at 0 ° C under normal acceleration of gravity (9.80665 m/s²). It represents the average atmospheric pressure at sea level using the latitude of Paris. It was used in technical documents during the period 1960-1980. Other hybrid units: mmHg/cm² or gram-force/cm², the kg / cm², he g/mol². For the record, the use of the kilogram, gram, kilogram force or gram force (or their symbols) as a unit of force is prohibited in the SI system as the unit of force is the Newton (N).